Stew enjoys tying standard patterns, modifying them slightly to use what he has on hand or to use materials he prefers to tie with. He favors natural materials that are obtained locally; such as quail, pheasant, duck and goose feathers, and hair from local game animals. Though not entirely "natural", Stew is excited about the possibilities offered by the iridescent dubbing he uses in the flies shown here. I have done well with the Kaufmann Stone tied with Iridescent Dubbing. The dubbing has a nice translucent quality, and has several colors mixed together to give it many tiny different colored points of light reflection. In my opinion the Iridescent dubbing makes the pattern far more effective than the goat that is often used. After tying the stone, I tease out a good bunch along the abdomen. The dubbing is tough and resists teasing, so I use the point of the bodkin, and aggressively dig away at it. I remember when I tied the first one. I was using goat, and was tying Kaufmann Black Stone nymphs. It was very late, and I was beat, but decided to tie one with the Iridescent dubbing anyway. The next morning I got up and looked at the nymphs. Unlike the previous evening, in the morning I had good light, and when I put two nymphs side by side in the sun the difference was like night and day. The Iridescent dubbed nymph was sparkling and had a translucent look on the edges, but the goat dubbed nymph looked flat and dead by comparison. Later when I fished them, it was clear that the Iridescent Dubbing nymphs look even better when wet than they do dry. My favorite and most productive nymph is a #12 Iridescent Kaufmann Golden Stone. It has done well for me a lot of times stream fishing. I fish the Southern Rockies, primarily Northern New Mexico and some in Southern Colorado. I have tied the golden stone pattern with mottled turkey wing cases, and also with wing cases of whitish turkey that is spotted with brown, black, and tan spots. I am not sure which is more effective. A friend has used the same Iridescent Golden Stone in lake fishing. I tie them for him in #8, as that is the size he really likes. I have no idea what the trout think they are getting when they take a golden stone pattern in a lake, but he swears that it has worked great for him, and it is his favorite nymph. The dubbing is available in several colors, but the two I use are the golden stone and the black stone. The dubbing is found in just a few shops. I suggest you contact Ronn Lucas, the supplier, by e-mail to find out about availability. 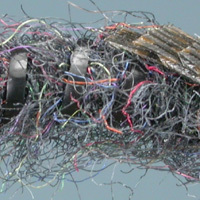 The dubbing is best applied with a dubbing loop, as it is pretty coarse and is a synthetic dubbing. Ronn Lucas has mentioned that it is a seal substitute. I tie the Kaufmanns with plenty of lead wire to weight it, and use appropriately colored yarn as an underbody and then go over it with an Iridescent Dubbing loop, as this makes the tying go more quickly. 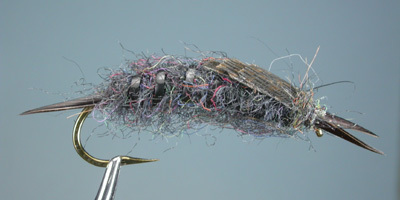 Tying Tips: (1) The dubbing is best tied with a dubbing loop, as it is pretty coarse and is a synthetic dubbing. (2) I tie the Kaufmanns with plenty of lead wire to weight it, and use appropriately colored yarn as an underbody and then go over it with the Iridescent in a dubbing loop, as this makes the tying go more quickly. (Optional) Bend the hook shank, at a point about one-third to one-half of the way from the eye of the hook, so that the point of the hook points to the eye of the hook. Lay down a base thread wrap and coat with head cement, let dry. Weight the shank with wraps of lead wire, and over-wrap with thread. 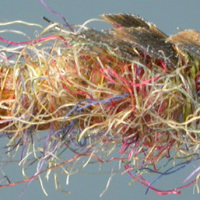 Using rabbit dubbing which matches the color of the Iridescent dubbing, form a ball of dubbing at the end of the shank and tie in the biots for the tail. The dubbing ball will angle the biots slightly upward. Tie in the vinyl rib at the base of the tail and then form a tapered under body forward to a point a little longer than one half the length of the hook shank. Form a dubbing loop of Iridescent dubbing and wrap the dubbing loop forward to form the back half of the body. On the large nymphs it is often necessary to repeat this step (sometimes twice) to get good coverage. Use plenty of the Iridescent dubbing, as you will dig it out aggressively. Wrap the ribbing forward to form a segmented look and tie down the ribbing, trimming of the excess. Use a bodkin to aggressively dig out the dubbing to give a buggy abdomen. Form a tapered base for the rear wingcase. I normally use yarn as an under body, and then use a dubbing loop and plenty of the Iridescent dubbing. Trim a piece of turkey feather to form a "v" shape for the rear edge of the wingcase and tie in. Use more yarn and dubbing to form a second tapered wingcase base in front of the first wingcase. Trim a second piece of turkey feather to form a "v" shape for the rear edge of the middle wingcase. The middle wingcase should be a little wider than the rear wingcase. Tie in the wingcase. Form a ball of rabbit dubbing at the base of the hook eye, and tie in the biots to form the antenna. Again use more yarn and dubbing to form a third tapered wingcase base in front of the middle wingcase. Trim a third piece of turkey feather, again with a "v" shape for the rear edge to form the front wingcase. It should be wider than the middle wingcase. Tie in the front wingcase. On the larger sizes, lay down several wraps of dubbed thread to cover the base of the front wingcase. Omit this step on the smaller sizes. Form a thread head, whip finish, and head cement. Again use the bodkin to aggressively dig out the dubbing to form a very buggy thorax. 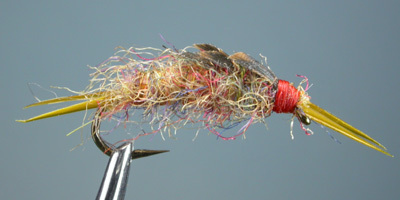 There are several tying steps needed to tie one of these nymphs, and it is not a quick tie for me. It takes practice to get down the spacing and shape of the wingcases. However, the trout don’t really care how neat the nymph is. They don’t count very well either, so if you run out of room when tying in the wingcases just tie in two wingcases. When tying the nymph, wrap the thread wraps fairly tightly to keep the body of the nymph firm. The Iridescent dubbing is tough stuff, and a strong tying thread is needed to hold things together when you are digging away at the dubbing to form the buggy appearance. For that reason use tough thread like 6/0 Unithread or some other strong tying thread. Finally, the black nymph is normally only tied from # 4 to #8; however, I use it also to represent the early black stone, and so also tie the smaller sizes. I have also been tempted to tie it in #2. The golden stone is normally only tied from #6 to #10, but I use it to represent smaller brown/dark amber stone nymphs as well, so also tie the #12. In fact, I have had the best success with the #12 golden stone nymph.